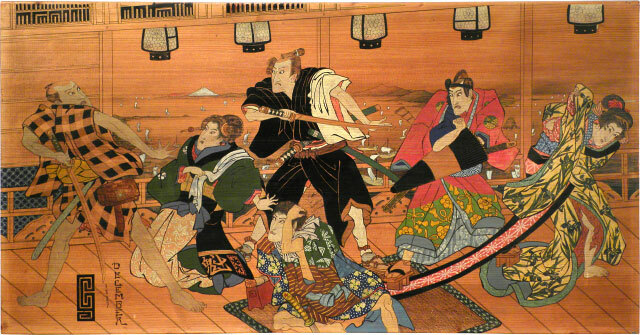 The composition of this panel is comprised of an assemblage of figures from unrelated single sheet Japanese kabuki woodblock prints, resulting in a nonsensical scene with a gathering of actors in costumed roles on a veranda surmounted by carved ranma (transom) decorated with a pattern based on genjimon and the iconic Mount Fuji in the distance. Thus far, three of the figures can be directly linked to specific 19th century kabuki prints. Starting from the left, the figure in the checked robe was derived from a print by the artist Utagawa Toyokuni I (1769-1825), depicting the actor Ichikawa Danjuro VII (1791-1859) in the role of Danshichi from the play Soga matsuri ikiji kurabe which was performed at the Morita-za in the 5th month of 1813. His tobacco pouch is adorned with the mimasu mon (crest) of the Ichikawa Danjuro line of actors. 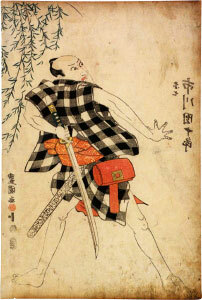 In order to best accommodate the composition of this panel the artist flipped the figure to face in the opposite direction, and changed the color of the obi from red to yellow. The second figure of the woman kneeling is from a print by Utagawa Kunisada (1786-1865) depicting the onnagata actor Iwai Kumesaburo II (1799-1836) in the role of Kasane from the play Banzai Okuni kabuki (another version of this play titled Meiboku sendai hagi) which was performed at the Ichimura-za from the 3rd month of 1827. 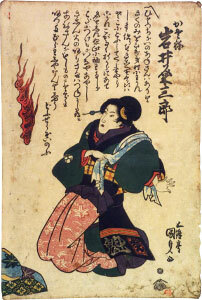 In this case the artist stayed faithful to Kunisada's design and palette. The third and fourth figures (standing while pulling a sword and kneeling while holding his head) have not yet been identified. 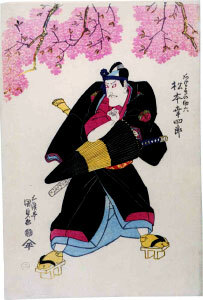 The fifth figure of a man holding an umbrella is recognizable as the role of Akemaki no Sukeroku, and in this case the specific print by Kunisada depicting Matsumoto Koshiro V from the play Sukeroku sakura no futae obi as performed at the Kawarasaki-za from the 3rd month in 1822 appears to be the original source. However, in this case the artist seems to have taken some liberties, apparently replacing the face of the actor Koshiro (with his distinctive exaggerated jaw) on Kunisada's print with that of an actor with more familiar proportions, (probably) Ichikawa Danjuro VII. The artist also changed the colors on Sukeroku's costume from the classic black robe and purple headband (both details are de rigueur for the role), to a bold red robe trimmed with ostentatious green and gold brocade, and a dark green headband. The last figure on the right of an actor in a female role struggling with her obi (which is pinned by the Sukeroku character under his geta) is not yet linked with a specific print but possibly depicts the onnagata actor Iwai Kumesaburo II (1799-1836) as the tragic courtesan Takao, the sister of Kasane (the other female role depicted on this panel) from the play Meiboku sendai hagi. While the artist relies heavily on Japanese printed works for source material, the panel appears to be the work of an accomplished Western painter who is talented enough to approximate a Japanese hand convincingly. Were it not for the incongruous design changes and stylized date and artist's seal, one could easily attribute this panel to a late 19th century Japanese ukiyo-e artist exhibiting Western influences. Although this panel was acquired at a small auction in New York in the 1970s, there is some evidence that suggests that the artist was European. Recently a large cabinet comprised of panels decorated in a similar manner with designs from Japanese woodblock prints was offered in Berlin but originated from an Austrian collection. The cabinet has four large panels and six smaller narrow panels. Two of the large panels are decorated with figural subjects, while all the remaining panels have natural bird and flower subjects. Stylistically the painting on the cabinet panels appears to be by the same hand as this kabuki panel, and indeed, each cabinet panel is signed with the same CA (?) monogram which is also found on the metal hardware. The cabinet panels are likewise dated with both a year (1895 or 1896), and the month in German, including, Janner and Feber, which is Austrian German- indicating that the artist may have been Austrian. 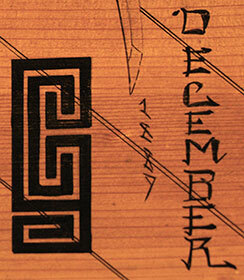 However, this connection is not conclusive, because the month on this kabuki panel, December, is in English (high German and Austrian German would be Dezember). The distinctive artist's seal or monogram CA (?) on both the cabinet and this panel appears to be derivative of Japanese genjimon- a group of 54 stylistic crests, each of which is associated with a specific chapter in 10th century epic saga, The Tale of Genji (Genji Monogatari). 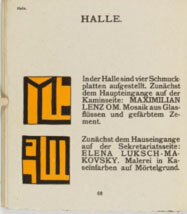 Similar genjimon-style artist's monograms are likewise found in an exhibition catalogue published in 1902 to accompany the fourteenth Exhibition of the Association of Austrian Artists, Vienna Secession (Ausstellung der Vereinigung Bildener Kunstler Osterreichs, Secceeion Wien) held at the Succession Hall in Vienna from April to May of 1902 which was dedicated to Ludwig van Beethoven (thus known as The Beethoven Exhibit). 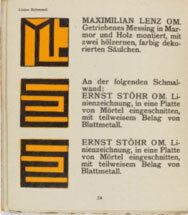 While this particular monogram in not in the catalogue listing information on works by 21 leading Secessionist artists, the similarity with some of the other designs in the catalogue is tantalizingly close and lends support to the theory that the artist of this panel may have been Austrian.